Challenging the Bonsai A to Z entry for Feeder Roots. We may not get it right all of the time, entries are added from all over the world and the meaning of the text may be slightly blurred for some of our users. If you would like to add to, clarify or change an entry then just let us know by typing your amendments in the box, we will check it out and update the entry where necessary. Thanks a lot, we really appreciate everyones help in keeping the A to Z of Bonsai accurate and up to date. 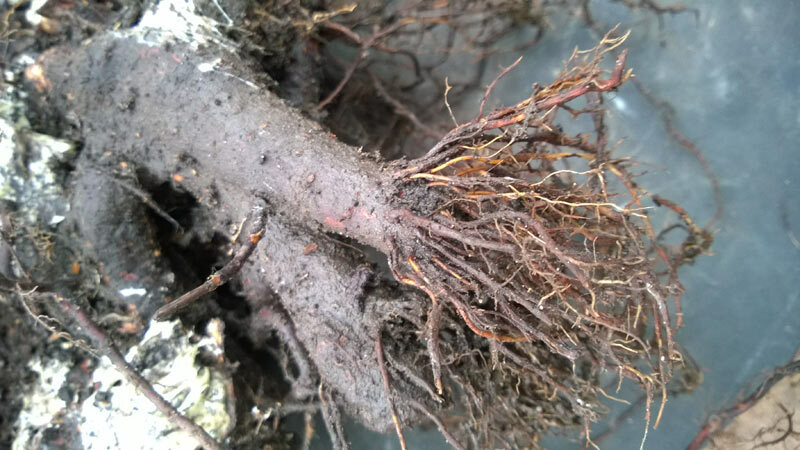 Those finer parts of the roots which collect the nutriets from the potting medium. Normally the fine roots at the ends of the thicker roots. Part of the technique used in bonsai is to encourage the growth of fine feeder roots closer to the main trunk of the tree. This is achieved by cutting back some of the main roots to stimulate new growth closer to the main trunk and may take place piecemeal over a number of repotting sessions across a number of years.. Some planning and care must be taken in root pruning to achieve the desired effect since the nebari of the bonsai tree is also a major consideration, and the main roots are also used naturally as support and anchorage for the tree. There are 819 entries in the A to Z and the pages have been viewed 3061175 times. Help us to increase the number of relevant bonsai terms included in this A to Z of Bonsai Terms. We include manufacturers and dealers in the dictionary, if you are one or know of one not mentioned then just click the link above and add an entry. If you have a favourite bonsai tree not mentioned just add an entry. We are trying to create a unique single free source for all bonsai terms and hope to capture worldwide bonsai terms for bonsai trees, bonsai clubs associations and national collections and the A to Z is free marketing for bonsai businesses and bonsai clubs.